If you don’t want the chore of composting with a large compost pile, you can still compost. Just use brown lunch bags. Don’t throw away those plain brown bags, or fast good restaurant bags. Save them for on the spot composting! They work great in any flower or vegetable garden. Vegetable gardening is greatly enhanced by the addition of organic matter form through the process of composting. Both the soil and plants are nourished, resulting in healthy plants and a high crop yield. I enjoy experimenting with various types of composting. See my article about planting in compost. The results of this experiment will surprise you. Any form of composting will benefit your garden, but what happens when you don’t have a lot of room, or time for a compost pile? While you are wandering around your yard doing your weeding, deadheading and other garden chores, just grab a bag and take it with you. Drop the weeds and other yard waste into the bag. When it is full, dig a hole in your garden large enough for the bag and drop it right in. Among perennials and shrubs is a great place to do this. 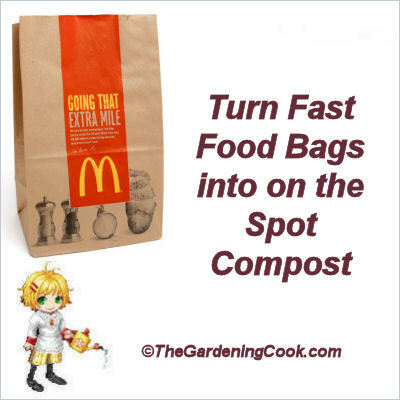 The waste and bag will turn into compost right on the spot over time and feed your plant. You can do the same thing with kitchen waste. Place it in a bag. Dig the hole and plant it in your garden bed. Your plants will love you for it. For another easy way to compost, when you don’t have the space for a large compost bin, try a rolling compost pile. It takes little space and makes compost quickly.